There’s a famous comment about women from the Dutch Renaissance social critic Erasmus, “Women, can’t live with them, can’t live without them.” Though I have heard the modern version in my house with men substituted. Nevertheless, had Erasmus been watching the Bulls as they are hanging onto a 3-2 lead in the first round playoff series with the Nets, he may have substituted that adage for the beloved Nate Robinson. The Bulls can’t live without Nate, but can they live with him? This series, which continues at the United Center Thursday, wouldn’t be so memorable without Robinson’s Game 4 triple overtime comeback masterpiece. Without Robinson, the Bulls probably are trying to avoid elimination Thursday instead of just a seventh game in Brooklyn. And who knows what else, as Robinson is the team’s second leading scorer in the series to Carlos Boozer at 17.8 points on 54.4 percent shooting. But when the Nets hung on in Game 5 in Brooklyn Monday and pulled away in a potential closeout game with Robinson starting his first ever playoff game for the injured Kirk Hinrich, the Nets constantly broke down the perimeter against Robinson. That forced the interior defenders to step up to stop the ball, enabling Brook Lopez and Reggie Evans to repeatedly get inside for rebounds and putbacks (22 rebounds, nine offensive) as the Nets doubled the Bulls in second chance points and dominated them on the boards 44-33. Plus, on the offensive end, the Bulls sputtered as Boozer got just eight shots with perimeter impatience looking inside. And Deng pretty much had to work hard for difficult shots, going six of 14 and missing his three pointers and now one of 18 from long range in the series. As Robinson led the team with 19 shots, in an effort to get to the boards, the backcourt was too often unprotected and the Nets ran and ran and finished with a 21-9 edge in fast break points in Game 5. Sure, everyone and Thibodeau, also, will talk about playing harder, more ferocious, getting up into your man, making their cuts more difficult, their shots better contested, screening harder. It is the fundamental elements Thibodeau mentioned where the Bulls failed, like keeping the ball out of the paint on penetration, which requires strong perimeter defense to enable the bigs inside to block off their men. It’s not hard to get an offensive rebound if the guy defending you is running out to stop someone driving down the lane. The more the ball doesn’t move side to side, the easier it is for the defense to set and make shots more difficult. Slashing lanes disappear for Deng. Postups get tougher and farther out for Boozer. Everyone’s actions produce comparable teammate reactions or lack of them. It’s why it’s so much a team sport. And the never ending changing rotations and lineups continue to leave that supposedly well oiled machine between a rock and a hard place, though Erasmus who also is credited with that one called it a stone and a shrine at the time. Yes, Robinson delivers so much good. But without Hinrich there is so much subtly lost. “Kirk is a big part; that’s obvious,” said Joakim Noah. “We all have to do a do a little bit more. No one is blaming Robinson for the loss, though the game changes without Hinrich, who remains questionable for Game 6. Deng is shooting 38.1 percent in the series and Joakim Noah 36.2 percent. Taj Gibson is averaging two rebounds in 15.4 minutes per game. Still, the Nets have been outplaying the Bulls the majority of the series. The Bulls have shot better, 47 percent to about 45 percent for the Nets. But in just about every major, traditional statistical category the Nets have had the advantage. The Nets lead in rebounding 211-206 and in offensive rebounding 53-47. 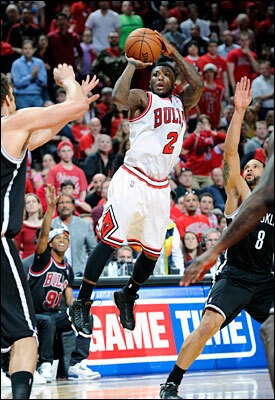 The Nets lead in three-point shooting, making 12 more and shooting 30 percent compared to 27 percent for the Bulls. The Nets have shot more free throws and shot them better, making 98 to 75 for the Bulls and shooting 78 percent to 66 percent for the Bulls from the line. The Bulls have more assists, but the Nets have more blocks and steals. The Nets have a 68-47 edge in fast break points and 232-200 on points in the paint. The teams are tied in second chance points. The Nets are averaging 101.6 points per game compared with 98.2 for the Bulls. Nate, for one thing, and those Bulls intangibles. Which are tangible when you employ them, though that becomes more difficult the fewer healthy players you have. Thibodeau is not big on adjustments or major changes as his direction is usually to compete harder. And the Bulls certainly have room for that after the Game 5 110-91 loss in Brooklyn. But what to do about Lopez, averaging 23.6, and Williams, averaging 20.6. Thibodeau started Robinson on Williams, though later had both Deng and Butler play him at times as the Nets went with three guard lineups with C.J. Watson and MarShon Brooks. Perhaps the Bulls use Butler more on Williams as Butler probably has been the team’s best perimeter defender in this series. Robinson is going to be in a mismatch whomever he plays, though perhaps better to have him in a mismatch against a player not counted on to score much and who doesn’t shoot well, like Gerald Wallace. Maybe have Deng more on Joe Johnson instead of Wallace as Johnson is more the perimeter threat and might have difficulty shooting over someone taller as Butler has mostly played him. Marco Belinelli shot well in Game 5 and Richard Hamilton certainly could defend Joe Johnson and give Johnson someone to defend on the other end at times. Though as Thibodeau likely will say it’s more about doing your job, playing aggressively and with energy, denying passes, boxing out stronger, screening firmly, basically not being pushed around by a Nets team generally not known for that but that has mostly done that the last few games. The Bulls stole one in Game 4 at home thanks to Robinson’s late regulation special, but also because of relentlessly tough play in the overtimes and a terrific all around game from Hinrich. He might not be there Thursday. But the Bulls will have to show up, as the cliché goes, or have a very tough game to show up for Saturday in Brooklyn. Erasmus is generally credited with coining not putting the cart before the horse as perhaps the first ever Brooklynite given his curious use of language. The Bulls might not want to be looking too far ahead because as Erasmus famously said in the land of the blind the one eyed man is king. I’m not sure how it applies, but I always did like that one. We’ll see if the Bulls have one left to like.